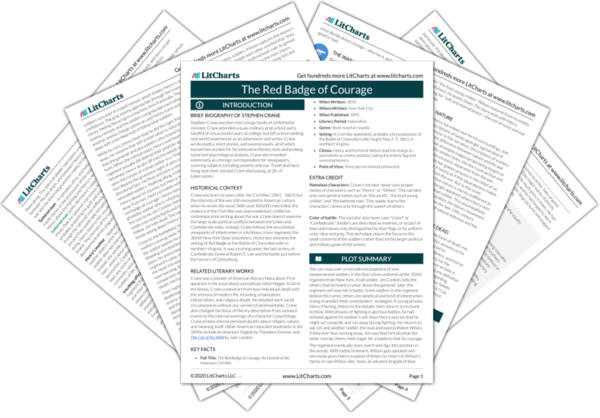 Instant downloads of all 942 LitChart PDFs (including The Red Badge of Courage). 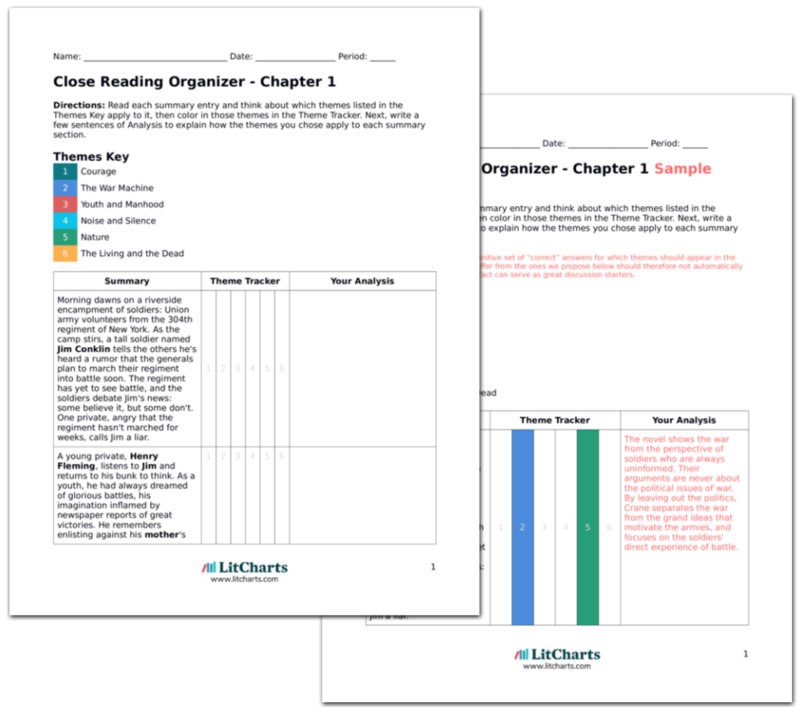 LitCharts assigns a color and icon to each theme in The Red Badge of Courage, which you can use to track the themes throughout the work. Henry's regiment stumbles forward to start their charge across a clearing. Enemy gunfire erupts from the distant woods, breaking up the regiment's formation. Soldiers collapse awkwardly when shot and the charge leaves a trail of bodies on the ground. Crane uses the charge to explore how individual actions can become group actions, and vice versa. When the charge falters, the soldiers break formation: they fall from a group back into individuals. Focusing on a distant clump of trees, Henry runs unconsciously ahead of the pack, looking crazed, like an "insane soldier." He feels as if he can sense everything around him: each blade of grass, the rough bark of trees, the feverish enemy, the falling soldiers. Once again, Henry is leading the battle charge, but is totally unaware of it, focused on a single goal. He's in a zone, only able to perceive close detail amid the chaos of war. At first, the soldiers feel like frenzied berserkers, but they soon falter, huddling together like dazed sheep. The lieutenant screams to get them moving. Wilson fires a shot into the woods, snapping the soldiers out of their trance. The regiment starts forward again. Everything depends on mindset. When confident, the soldiers transcend their individuality and become dangerous. When doubtful, they huddle like a herd of frightened animals. But when they reach some trees, the soldiers hesitate a second time. The lieutenant, Henry, and Wilson all scream at the men to push on. Their flag obediently gets moving again and the men follow. Running nearby, Henry feels a deep love for the flag. It seems like a goddess to him, "a creation of beauty and invulnerability." Henry's personification of the flag as a goddess represents how soldiers under stress need strong symbols to believe in. Confident leaders can do the same job. Notice how Henry and Wilson help the lieutenant inspire the men. 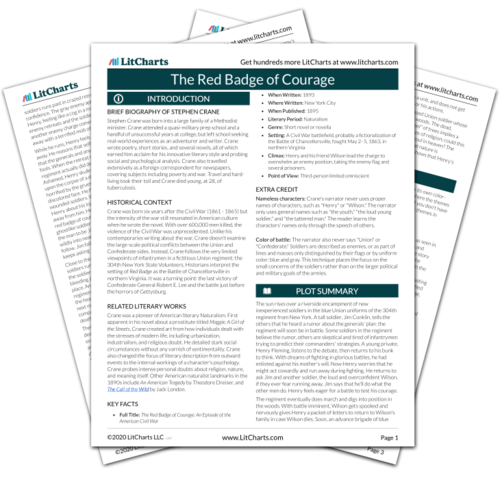 Get the entire The Red Badge of Courage LitChart as a printable PDF. Henry sees the color sergeant get shot and stumble. He and Wilson each lunge for the flag and they tug it away from the corpse's firm grasp. If the flag falls, the symbolic power dies with its carrier. The two friends struggle to keep the flag's meaning alive. Fyfe, Paul. "The Red Badge of Courage Chapter 19." LitCharts. LitCharts LLC, 22 Jul 2013. Web. 12 Dec 2018. Fyfe, Paul. "The Red Badge of Courage Chapter 19." LitCharts LLC, July 22, 2013. Retrieved December 12, 2018. https://www.litcharts.com/lit/the-red-badge-of-courage/chapter-19.